The Latest Word From WHO On Experimental Ebola Therapies : Goats and Soda Vaccinations and therapeutics are being tested. Some could be available for use as early as November, if they prove to be safe. 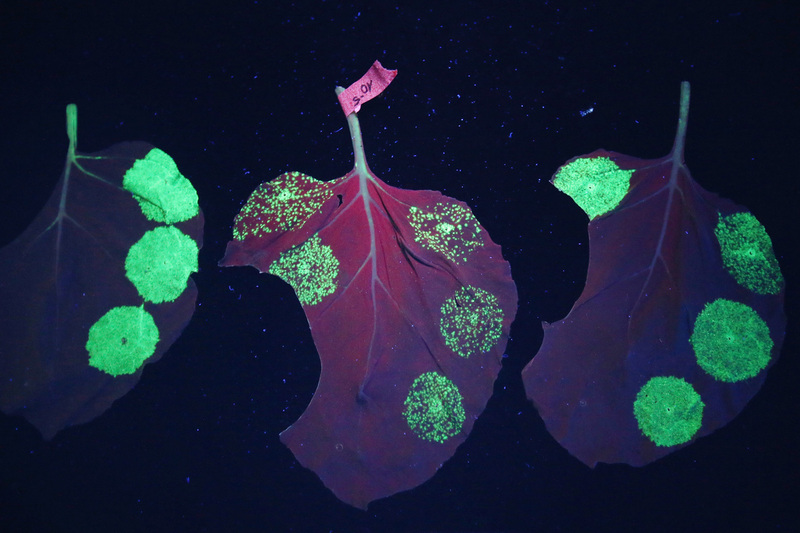 Proteins and enzymes that will produce antibodies for the experimental Ebola drug ZMapp are developed on the leaves of the nicotiana benthamiana plant, a relative of tobacco. Here, indicator proteins glow under ultraviolet light — a way to assess the success of bacteria spread. One of the reasons Ebola is so terrifying is that there's no vaccine and no cure. But the World Health Organization hopes to change that, with plans to quickly test experimental products during this outbreak. By November, two promising vaccines will have been tested on people to see if they're safe, says Marie-Paule Kieny, assistant director-general at WHO. "After that, these vaccines will start to be rolled out in the affected countries starting with health care workers and other front-line staff," Kieny said at a press conference held after a two-day meeting in Geneva on how to speed up the development of experimental vaccines and therapeutics. Around 200 experts came — including officials from the countries hit by Ebola, researchers from government labs and biomedical companies, and experts on clinical trials. The group agreed that a priority was to help affected countries use "convalescent serum" — taking blood from Ebola survivors and using it as a therapy for people stricken with the disease. "This is one thing which is real-time, now," says Kieny, adding that there was a good chance the procedure could help, and that affected countries needed assistance to make sure they draw and prepare the blood safely. In addition, she expects that several other experimental treatments will be tested in treatment centers, once research protocols can be worked out. "This can happen only at the place where the disease is present," she says. Michael Kurilla, who heads a biodefense research office at the National Institute of Allergy and Infectious Diseases, told the group that a slew of products are at various stages of development, although there's no clear front-runner. "I think if there had been an ideal perfect candidate that everyone agreed upon, there wouldn't be the need for this meeting," says Kurilla. Of the two main vaccine contenders, one just started safety testing in people this week. If all goes well, production of this vaccine could be ramped up quickly, and 15,000 doses could be ready by year's end. Eight hundred doses of the other vaccine have been donated to WHO. Supplies of any potential treatments will be much more limited than vaccine supplies. A few Ebola patients did get a "secret serum" called ZMapp, which is a cocktail of antibodies. Now there's no more of it. In the next six months, Kurilla expects to see production of only a few hundred doses of this serum. No one knows if any of these products are safe, much less effective. Historically, most therapies that make it into initial human tests never get approved as drugs, Kurilla notes, "because they're found to be deficient in many ways. And so it is because of some of that that people feel you need to be especially cautious." What's more, health care workers in West Africa are already overworked and overwhelmed just trying to provide basic medical care in very difficult conditions. "We are sometimes unable to give patients IVs. We are sometimes unable to give patients all of the care that we could have available and that is relatively simple," says Estrella Lasry, a tropical medicine expert with Doctors Without Borders in New York. As things stand now, about half of those who get Ebola do survive. If supportive care were better, even more might live. "If you are going to put them at risk of not surviving because of using a new drug where you don't have a guarantee of the safety, then the 'do no harm' principle is not being kept," says Lasry. She says it would be different for patients with a very poor prognosis who really have no other hope. Her organization is willing to help test new drugs — and even vaccines — if studies are set up in a rigorous, ethical way and the effort doesn't detract from the urgent need to get more doctors, nurses and public health workers to provide the tried-and-true basics. That's something everyone agrees on. "The issue right now is taking the tools that we have — infection control, finding cases, trying to get people into treatment — and pushing on those as much as possible while we wait for the work on the vaccines and medicines to go forward," says Keiji Fukuda, assistant director-general for health security at the World Health Organization. "The possibility of having vaccines and medicines which are safe and effective against Ebola would be great. But the reality is right now they definitely are experimental."